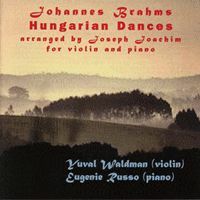 The influence of Hungarian music can be heard repeatedly in Brahms’ orchestral and chamber music, the last movement of the Violin Concerto being an example. Sometimes Brahms even acknowledged this influence, as in the finale of the Piano Quartet Op. 25 in g-minor, entitled “alle zingarese“. It was one of the many musical predilections he shared with Joachim, who subtitled his own Violin Concerto “in the Hungarian Style“. The two sets of Hungarian Dances were written for piano four hands between 1852 until 1869, and were first published by Simrock in 1869 and 1880. Joachim arranged the dances for violin and piano almost immediately, the first of these appearing in 1871 and the second book the same year as Brahms’.